THE signs are that some Spurs supporters will have neither the stamina nor the sanity to get through the traumas of the coming season. Their reaction to Tottenham�s 3-0 defeat by Premier League favourites Manchester City in a warm-up match in Nashville bordered on the hysterical. 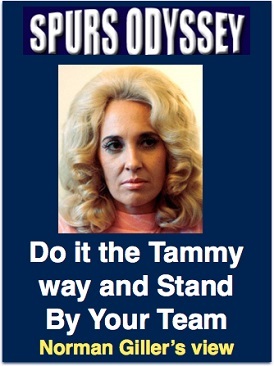 As Nashville queen Tammy Wynette might say: Stand By Your Team. This is not the time to be putting the boot in on Mauricio Pochettino and Daniel Levy before a ball has even been kicked in the 2017-18 season. Yes, it was a loose and at times undisciplined display by Spurs against a City team looking sharp and brimming with confidence. But judging Tottenham on this performance is like trying to decide a Derby winner by the way it canters down to the start. I saw no evidence of Real Madrid fans going into foul-mouthed meltdown after their 4-1 defeat by the multi-million pounds City side. For me, the constant booing and jeering of �53m import from Tottenham Kyle Walker was unnecessary and unacceptable. But as I appear to have morphed into the Tottenham version of Victor Meldrew I guess I am out of step with modern football fans, who seem to show little respect for opponents or even some of their own players. Kyle served Spurs well, earned them a small fortune and is now free to shape a new, lucrative future for himself. Good luck to the lad. The only action that matters is at Newcastle on August 13. If Spurs lose that 3-0 then some of the crippling criticisms I have read on line during and following the thumping in Tennessee just might be justified, not that I will ever condone the vile stuff. My understanding is that Tottenham have still not given up on signing Ross Barkley, but there are several clubs who would like to torpedo the transfer. A stumbling block could be that Barkley�s agent is holding out for wages of �100,000+ a week. The world has gone mad. We must trust in Pochettino, and applaud Spurs for being responsible and sensible in the transfer market and not buying for the sake of it. Stand by your team. Meantime it�s all eyes on Wembley as Spurs prepare for their final warm-up of the close season against Italian champions Juventus on Saturday. Win or lose, remember it is still the phoney war. It�s taking goals to Newcastle that really matters. NOW join me for the further adventures of Tottenham�s Double year of 1960-61, focusing on Part Nine of our visit to the greatest season in the club�s history. On the 50th anniversary of the FA Cup victory over Leicester at Wembley, I combined with entrepreneur and life-long Spurs supporter Terry Baker to produce a limited edition book of the Golden Double, that was introduced and autographed by Braveheart Dave Mackay. IT looked a potential classic on paper, League leaders Tottenham against League champions Burnley in the semi-final of the FA Cup. But on the pitch it proved something of a damp squib, mainly because the Lancastrians were not allowed to find their shape and rhythm by a Spurs side in determined mood to make it to Wembley. Tottenham fans with good memories were nervous, because Spurs had lost their last three FA Cup semi-finals at Villa Park, but while Burnley had much of the territorial advantage in the first-half they were not allowed to trouble goalkeeper Bill Brown as Peter Baker, Ron Henry and Maurice Norman each played to the peak of their powers. It was a rare mistake by Burnley skipper Jimmy Adamson that let Spurs in for a nerve-settling opening goal on the half hour. Bobby Smith beat goalkeeper Adam Blacklaw with a rising shot after Adamson had lost control of the ball. Spurs should have had a penalty just before half-time when the referee failed to spot Burnley full-back John Angus punching out a Terry Dyson header. Jimmy Robson had an equaliser ruled out early in the second-half because of a foul on Maurice Norman, and then Ron Henry was lucky to get away with handling the ball on the goalline. Smith knocked the wind out of Burnley with a crashing right foot shot in the 49th minute, and Cliff Jones scored in the last minute to give the scoreline a flattering look.Wembley and the Double here we come! QUOTE � Cliff Jones: "For the first time in weeks Danny went back to his talk of the Double during the build-up to the semi-final. He convinced us that history was at our feet, and we went into the match absolutely determined to get the better of a very good Burnley side." THE euphoria at reaching the FA Cup final was replaced just four days later by edginess as Spurs slumped to a shock home defeat against a Newcastle side who were third from the bottom of the table and haunted by the threat of relegation. Suddenly the lead over Sheffield Wednesday at the top of the table had been cut to four points. The astonishing fact is that Spurs could and should have been leading by at least six goals at half-time after battering the Newcastle defence in the most one-sided first-half witnessed at the Lane all season. They had to be content with just a 1-0 lead at half-time provided by Les Allen after inventive work by Cliff Jones on the right wing. Goalkeeper Dave Hollins, brother of Chelsea's John, was making his Newcastle debut and made at least a dozen saves before Ivor Allchurch stole a stunning equaliser in the 64th minute. Dramatically, the Tottenham players began to look tired as if all their effort of the last seven months had caught up with them. Bobby Smith was hobbling, and Dave Mackay and John White were looking ragged and not their usual dominating selves. Newcastle could hardly believe they were getting out of jail when former Manchester United outside-left Albert Scanlon ended a counter-attack with a lob that caught Bill Brown out of position and helpless to stop the ball sailing into the net. Back-to-back League defeats for the first time in the season had Tottenham knees knocking. QUOTE � Danny Blanchflower: "Anybody who witnessed this match will confirm it was a completely freak result. If we had scored ten goals it would have reflected our supremacy. We must keep our nerve, and be positive. The Double is very much on." NOW for something completely different � a goalless draw, the only time this scoreline featured throughout the Double season. Alarm bells were ringing in the Tottenham camp, because there was no question that the players were looking jaded and in need of a break just when their peak performances were required. They had now gone from February 25 since they had won a League match. Even the usually indomitable Dave Mackay seemed to be almost burnt out, and he struggled to control the menace of Fulham playmaker Johnny Haynes in a desperate scrap at Craven Cottage. Luckily for Tottenham the probing passes from Haynes were not being converted into goals by team-mates who were not in his class. Schemer Haynes should have turned scorer twice in the second-half, but failed to find the net when clean through on goal. The sudden nervousness of the Spurs players spread to their supporters, who were being reminded that the previous season it was successive home defeats by Chelsea and Manchester City that had stopped their chase for the championship over the Easter period. As the final whistle blew at the Cottage the news came through that Sheffield Wednesday had crushed Manchester United 5-1. They were now just three points behind Tottenham, and there was widespread conjecture that the jinx of Double-chasing teams was about to descend on a Spurs side that was no longer looking in the Super category. QUOTE � Terry Dyson: "The Boss didn't mince his words. He told us we were getting lazy and not focusing as we had earlier in the season. I don't think it was laziness as much as we were knackered. But we did need a kick up the arse, and Bill gave it to us." TOTTENHAM TEAM: Brown, Baker, Henry; Blanchflower, Norman, Mackay; Jones, White, Smith, Allen, Dyson. THE Tottenham goal drought in the League stretched to 190 minutes after a goalless first-half against Chelsea in this Good Friday derby, and you could almost hear the sound of knocking knees on the terraces. Equally, there was a tsunami of relief when Cliff Jones carefully walked a Danny Blanchflower pass into the net two minutes into the second-half. A weight had been lifted off the shoulders of the Tottenham players, and they sent Chelsea reeling with an avalanche of attacks that spawned goals from Jones again, Les Allen and Frank Saul, who was deputising for injured Bobby Smith. Dave Mackay was also missing through injury, and Tony Marchi earned man-of-the-match ratings in the way he filled the great Mackay's shirt and kept a young Chelsea goal master called Jimmy Greaves on a tight leash. Chelsea managed to add a little respectability to the scoreline with two late goals from Bobby Tambling and Ron Tindall, but the fact was that they had been outplayed by a Tottenham team who once again looked the part of champions in waiting. Sheffield Wednesday were determined to try to take the title race down to the wire, and they kept three points behind with a 1-0 victory over Newcastle, who slipped to bottom place in the table on their way to relegation. QUOTE � Les Allen: "This was a sweet victory against my old club. It restored our confidence just when people were starting to question whether we could win the championship, let alone the FA Cup. We were all aware of how the title had slipped out of our fingers with two defeats in the Easter period last season, and we were determined not to let that happen again." TEAM AND SCORERS: Brown, Baker, Henry; Blanchflower, Norman, Marchi; Jones, White, Saul, Allen, Dyson. Scorers: Jones (2), Allen, Saul. IT was once-proud Preston who were made to look the part of fools in this April 1 clash in which Tottenham carried on where they had left off against Chelsea the previous day. Preston were under siege from the third minute, when John White � recovering his early-season form � scored with a rare long-range shot that squeezed under the body of the diving goalkeeper Alan Kelly on a treacherously wet surface. There were special celebrations for the second goal, steered deftly into the net by Cliff Jones following one of those sweeping pitch-length passing movements that had become a Tottenham trademark. The significance: this was the 100th League goal scored by Spurs since the first match back in August. Frank Saul, looking more and more comfortable in the No 9 shirt, scored goal number 101, and then Danny Blanchflower completely fooled the Preston defenders with a dummied free-kick before passing the ball to Jones, who gleefully collected his second goal. The fifth and final goal was a Cliff Jones exhibition piece as he completed his hat-trick with a stunning overhead kick. Poor Preston replaced Newcastle at the bottom of the table on their way down into the Second Division. Sheffield Wednesday could only draw 1-1 against Blackburn Rovers at Ewood Park, and now no bookmakers would accept bets on Tottenham winning the title. Scorers: White, Jones (3), Saul. CHELSEA gave Spurs a scare before losing a five-goal thriller, and as Sheffield Wednesday dropped a point against Newcastle it was odds-on the title coming to White Hart Lane. This Bank Holiday Monday victory meant Tottenham had taken a maximum six points from their three Easter matches and silenced the critics doubting their staying power. Bobby Smith � looking back to his swashbuckling best � had vowed to get a goal against the club that had let him go, and he put action where his mouth was in the seventh minute with a thumping header. The odds on Tottenham winning shortened when Chelsea winger Peter Brabrook went off in the 34th minute after dislocating his shoulder in a collision with Maurice Norman. But the ten men of Chelsea gritted their teeth and made a battle of it. Jimmy Greaves celebrated what he thought was an equaliser until the referee ruled one of his team-mates had been off-side. Greavsie was booked for disputing the decision. Frank Blunstone pulled Chelsea level three minutes after half-time, and then Greaves made one of his typical runs from the halfway line and slotted the ball wide of Bill Brown to put Chelsea 2-1 in the lead. Jimmy played with a secret: He was on his way to Milan at the end of the season. Tottenham showed they had character to go with their class following the Greaves goal. They dug deep to draw level through Terry Medwin. It was an eventful match for gentle giant Maurice Norman, who celebrated his recent wedding by heading in a Dave Mackay free-kick for a vital winning goal. QUOTE � Maurice Norman: "It has been an Easter I will never forget. My wedding, three victories and then getting the winning goal against Chelsea. The title is nearly ours." THE fear factor of a month before had now been replaced by something of the old arrogance and swagger, and Spurs went about quickly putting Birmingham to the sword. The match was barely a minute old when they took the lead, forcing a corner from which John White headed against the bar, with Bobby Smith forcing in the rebound. During a wave of attacks, John White had a perfectly good looking goal disallowed for off-side, and then � ironically � they scored their second goal through Les Allen, who tapped in a centre from a clearly off-side Bobby Smith. The non-stop blitz continued, and John White made it 3-0 after a mix up in the battered Birmingham defence. In a rare City raid in the 39th minute, schemer Jimmy Bloomfield was upended and Jimmy Harris placed the ball for the spot-kick. He hammered the ball wide, but the referee ruled that it should be retaken because Bill Brown had moved. Harris made no mistake at the second time of asking. The half-time scoreline read 3-1, when it could so easily have been 8-1. Two minutes after the interval Harris scored a second goal when he got on the end of a through ball from Bloomfield and guided the ball wide of the approaching Brown. With Danny Blanchflower curbing his natural attacking instincts to help out in defence, Tottenham suffocated the Birmingham revival. The Spurs players and fans were delighted when they heard Sheffield Wednesday, the only team that could beat them to the title, had dropped another point at home to Leicester City. QUOTE � Danny Blanchflower: "Our destiny is now in our hands. We know that if we can beat Sheffield Wednesday in our next match the championship is ours." Join us here next week for the final thrilling instalment as Super Spurs clinch the Double. Each week during the close season, I am setting a Tottenham teaser, just for fun and to keep you thinking about the club�s great history. Last week I asked: Which Yorkshireman was a youth player with Leeds, has won 12 England caps and scored in his League debut against Arsenal? Yes, of course, it was Danny Rose, who made a sensational start to his Tottenham career with an unforgettable goal against the old enemy. Spurs, having sold his partner and fellow-Yorkshireman Kyle Walker, need a fully fit Rose for the coming season. First name drawn from the correct answers was Ian Shaw from Bristol, who has been a Spurs supporter since seeing them win the 1981 FA Cup final on TV. I will send Ian a screen version of my Spurs �67 book (you might consider buying a signed copy from me at http://www.normangillerbooks.com � all profits to the Tottenham Tribute Trust to help our old heroes). This week�s teaser: Which Tottenham defender signed by Bill Nicholson wore the No 5 Spurs shirt in an FA Cup final and played for and managed his national side? Email your answer please to SOQLTeaser13@normangillerbooks.com Closing date: midnight this Friday. I will send a screen version of Spurs �67 to the first name drawn from the correct answers.